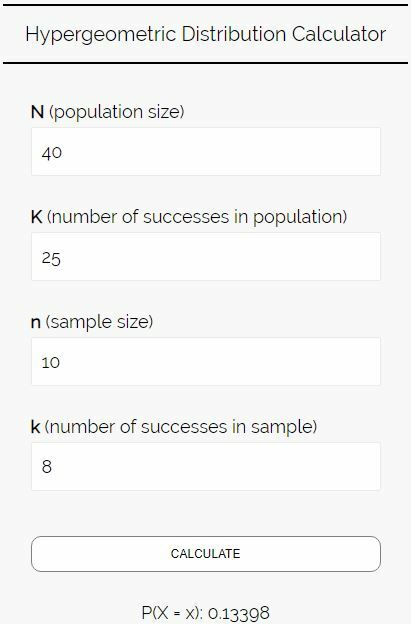 A hypergeometric distribution tells us the probability of getting k successes in n attempts without replacement from a population of size N with K successes in the population. 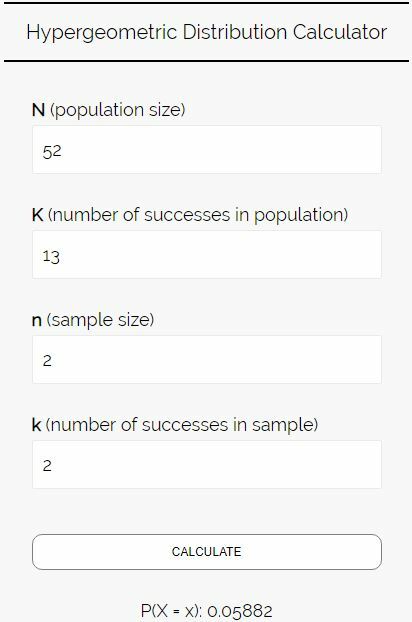 where KCk represents the number of combinations of K objects taken k at a time. 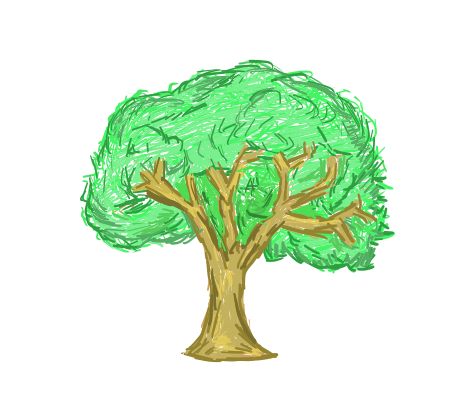 Let’s walk through some examples to get a better understanding of the hypergeometric distribution. There are 15 blue marbles and 5 red marbles in a bag. You close your eyes and draw 7 marbles without replacement. What is the probability that exactly 3 of the marbles you draw are red? 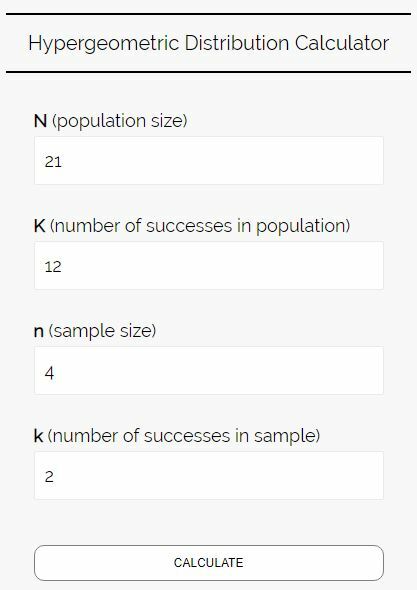 Step 1: Identify the four numbers needed to calculate a hypergeometric probability: sample size (n), number of successes in sample (k), population size (N), and number of successes in the population (K). Step 2: Plug these numbers into the hypergeometric formula or a hypergeometric calculator. Note: I used the Combinations Calculator to find the combinations in the above calculation. Thus, the probability of drawing exactly 3 red marbles is 0.02935. This result matches the result we got in the calculation above. The probability that we draw exactly 3 red marbles is 0.02935. There are 12 green balls and 9 yellow balls in a bag. You close your eyes and draw 4 balls without replacement. 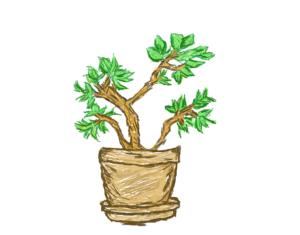 What is the probability that less than 2 of the balls you draw are green? 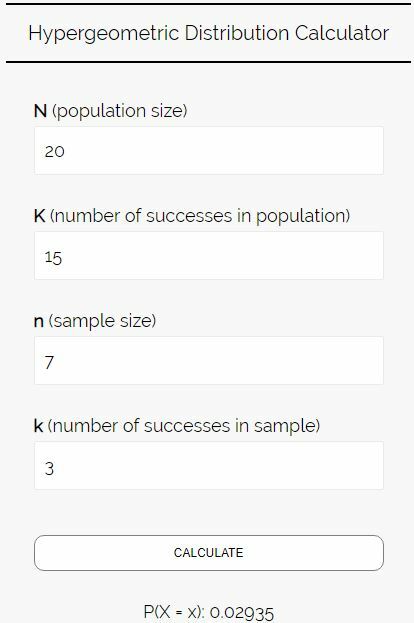 Step 2: Plug these numbers into the hypergeometric calculator. Since we are interested in the probability of choosing less than 2 green balls, the answer is 0.18947. The names of 40 students are in a bag, 15 of whom belong to classroom A and 25 of whom belong to classroom B. You close your eyes and draw 10 names without replacement. What is the probability that exactly 8 of the names are from classroom B? Thus, the probability of drawing exactly 8 names from classroom B is 0.13398. This result matches the result we got in the calculation above. The probability that we draw exactly 8 names from classroom B is 0.13398. There are 52 cards in a deck, 13 of which are clubs. You close your eyes and randomly draw 2 cards without replacement. What is the probability that both cards are clubs? The probability that both cards are clubs is 0.05882. The first time you draw a card from the deck, the probability that it’s a club is 13/52. The second time you draw a card, there are only 51 cards left in the deck. Since you picked a club the first time, there are only 12 clubs left in the deck. Thus, the probability of picking a club the second time is 12/51. 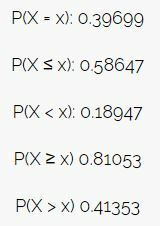 To find the probability that you draw a club both times, we can simply multiply these two probabilities together: (13/52) * (12/51) = 0.05882.